Goodfellow Bros. Moves to a New Location in Downtown Wenatchee — Goodfellow Bros.
Wenatchee, WA – Goodfellow Bros., (GBI) a heavy-civil construction company founded in Wenatchee, WA, announced it moved from its location on Walla Walla Avenue, to a new home in downtown Wenatchee at 135 N. Wenatchee Avenue. The 12,000-SF space is located in the Metropolitan building, formerly known as the Dore building and boarding house that sat vacant for 20+ years. 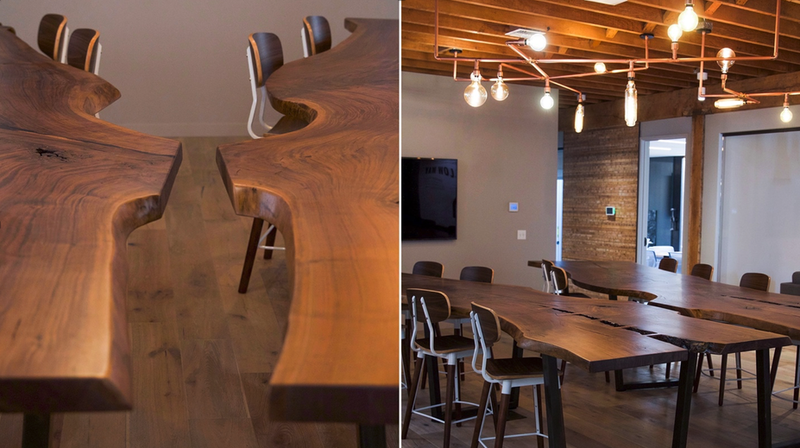 The contractor, Eider Construction, reused the original vertical-grain fir flooring and two-by-fourteens to help honor the historic building against more modern materials. GBI, whose roots were established in the area in 1921, had a desire to relocate closer to downtown businesses and the vibrancy of the area. During its humble beginnings in Wenatchee Washington, Jim Goodfellow, Sr. and his brothers had a vision: to help build our country. Now, nearly 100 years later, GBI has grown its operations to include ten offices in Washington, Oregon, California and Hawaii, but still calls Wenatchee home. Photography courtesy of Mary Rauzi, Embr Creative.